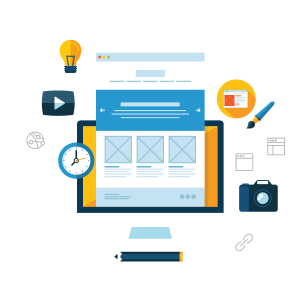 Capital District Digital’s web design and development team will make sure your e-commerce website is optimized, mobile-friendly and designed to increase website traffic. Why do E-commerce websites designed by Capital District Digital perform? We believe that outstanding E-commerce Web design and clean code are bare minimums. To compete in today’s digital marketplace, you need an agency that can also put your website to work. We're proud to announce the launch of Capital ePay. Capital ePay is a WordPress credit card payment gateway plugin that pairs with the WooCommerce shopping cart. The gateway provides seamless credit card transactions by placing a credit form directly on the customer's website. We designed this gateway due to the requests from our clients not wanting to use PayPal. Our biggest complaint was that other credit card gateways redirected customers at their checkout page and forced them to create a username and password prior to processing the transaction. We also added the option to accept subscription credit card recurring payments and a way to refund full or partial orders. To learn more about our e-commerce payment gateway, credit card fees or download the plugin, visit us at https://capitalepay.com. We make sure your website, and your brand, are optimized, which will help you attract the right customers and increase your Google page rank. We will make sure your customers and prospects have a great brand experience by building responsive E-commerce websites that resize automatically no matter what device they use. We create all sites utilizing a WordPress content management system, making it easy for you to update and add new products. Today, more than ever, it is important to have a website that portrays your brand in the best possible way online. When consumers are making purchasing decisions, the first thing they do is go onto the companies website to learn more about what they are interested in buying. Studies have shown that consumers make their purchasing decisions in a matter of seconds, by judging the visual elements of the brand. In order to increase leads and sales from your online channels, it is important to have a proper E-commerce framework in place – this starts with your website. Once we have a clear picture of what you want, we design a mock-up utilizing specific elements from your brand (i.e. color scheme, typography, etc). All e-commerce websites that we create are built on a responsive framework. This means that they adjust to fit any browser or internet viewing device, like our website. Our developers also utilize content management systems such as WordPress to make it simple for you to make small updates to your online store once it is completed. Excellent service and high quality design ideas!!! A huge thanks to Capital District Digital for creating such a great website! Your online ticket booking software helped us increase sales. The past year I’ve worked closely with Kaila and Anthony to improve our existing website. Before they worked their creative magic, our website was very bland, consisting of only minimum text and one small photo. In the past customers were unable to book tours online, restricting customer to book only Monday – Friday. After brainstorming with our team, Kaila and Anthony effectively exceeded our expectations. We are now able to add beautiful high-res photos, videos, and PDF's to promote our tours and our customers now have the ability to book online 24/7, this has increased our bookings significantly. To our surprise, 60% of our current online customers are new users and have never traveled with Wade Tours. Kaila and Anthony are always on top of things, easy to work with, and our requests are always met. They are continuously updating our website and coming up with ideas to make it the best it can be. I highly recommend working with Kaila and Anthony, they are two of the most knowledgeable consultants I have worked with. My website hadn’t been changed since 2008 and I knew it needed an update. After speaking with Anthony Troia, web developer of Capital District Digital, I realized that I needed more than just a new site. I needed to have a mobile ready site, a better SE0 presence, and a way to get found locally. I also spoke with web designer, Kaila Troia, I realized that she could redesign my entire site. As a key note speaker and business strategist, I thought I had all of the ideas for my site. I quickly realized that brainstorming with Anthony and Kaila there were so many more things I could do. This is really the best customer service you could get from a web developer. Thank you so much for getting everything done in a timely manner and always coming up with new ideas to improve my site. I am hearing lots of great comments on the site so far! Capital District Digital is full of ideas and support for your business! The digital arena is definitely their forte and they take great care to make sure all pieces are integrated into your internet presence. Their personalized service is great! Dream Street Modulars has been with Anthony Troia and Kaila Troia at Capital District Digital for at least 2 years. They met with us and brainstormed ideas for a new website presence for us at a completely reasonable cost. By first taking the time to understand our business and what we represent in our industry and to our customers, they were able to make our website exciting. We are now accessible to mobile devices as well as standard and our website is optimized in search engines. This has enabled us to double our business in a very difficult and competitive marketplace. We are extremely happy with the addition of video and photo enhancements. Capital District Digital is the place to build your website and business. Thank you Anthony and Kaila! Anthony and Kaila redesigned our web site in 2016 and we continue to receive compliments from our customers and other dealers. We have been a client for well over a year and the service has been both professional and very responsive. I have recommended Capital District Digital to friends and associates and will continue to do so. Kaila and Anthony are an excellent team. They met with me and went over ideas and out main goal was not just a website remodel but to make it visually perfect on phones as well! I of course was so busy and when I contacted them I needed site done in less than 15 days! WOW. Less than a week and I have a new website. I couldn’t be happier with turn around, communication and also the way we collaborated with design ideas! I highly recommend this company. Plus they are one of my happy couples from this year and I was honored to be their photographer ! Capital District Digital Albany, NY 5 out of 5 based on 14 ratings. 14 user reviews.